I hope this finds you well! It was really nice to have so many of you stop and visit when I was set up at the Autumn Drive Festival. Save the date now for the 30th annual event, same time and place, October 20, 21 & 22, 2017. Angel Phantom Quartz IS Amphibole Quartz. So, what does this mean? 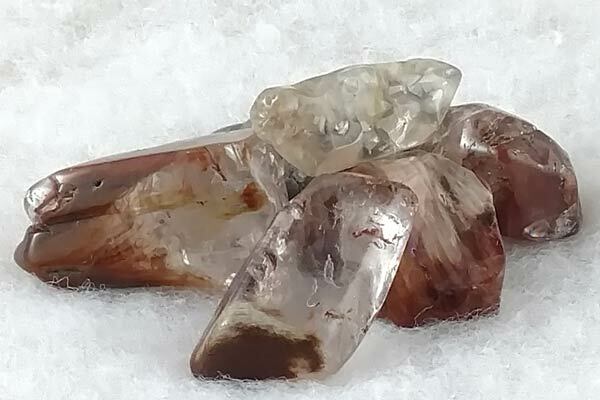 Amphibole Quartz is in the Trigonal Crystal System in the mineral class of Silicates. Its composition is SiO2 - Silicon Dioxide with a variety of mineral inclusions. These beautiful pieces are found in Brazil with coloring that is clear to white with many inclusions. I can get lost gazing into them seeing many different things at each look I take. The white areas contained in them are generally inclusions of White Kaolinite. This may help to explain the boost of its clairaudient abilities. They may also have Limonite inclusions, which is the shades of yellow, brown or gold. The Limonite brings about vibrations that assist with physical energy, vitality, well-being and psychic protection. Some may contain inclusions of Hematite with varying colors ranging from a deep red, to pink, orangey pink and orange. Ones with Hematite inclusions help us to obtain clarity, peacefulness and a sense of deep grounding. This explained to me what I felt on picking one up my first time, I definitely felt a buzz in my Crown and Root Chakras simultaniously creating that warm 'n fuzzy feeling.